I hope you all spent a fabulous Easter with your family, ate delicious roasted lamb, drank some fruity wine and indulged in things you gave up for Lent. Our Easter felt a bit more like Christmas, waking up to at least 15cm of fresh snow each morning. Great for everyone who can ski – spring skiing is the best. Not so fun for people like moi who are one-armed and banned from all winter sports. I did make good use of my ski pass though and soaked up some sun on the top of mountains. Wonderful. Need an idea of what to do with some left over chocolate bunnies? How about trying this classic, adapted from an Italian chef – Gennaro Contaldo. It’s one of the last desserts I made for my father and to my (and his) surprise he declared it better than his beloved Stalden chocolate crème (a Nestlé dessert classic for the true Swiss). Now, my friends, trust me when I say that is a compliment. See for yourself. Following the previous post, I present you with cake number 2 of 5 baked for the birthday festivities. 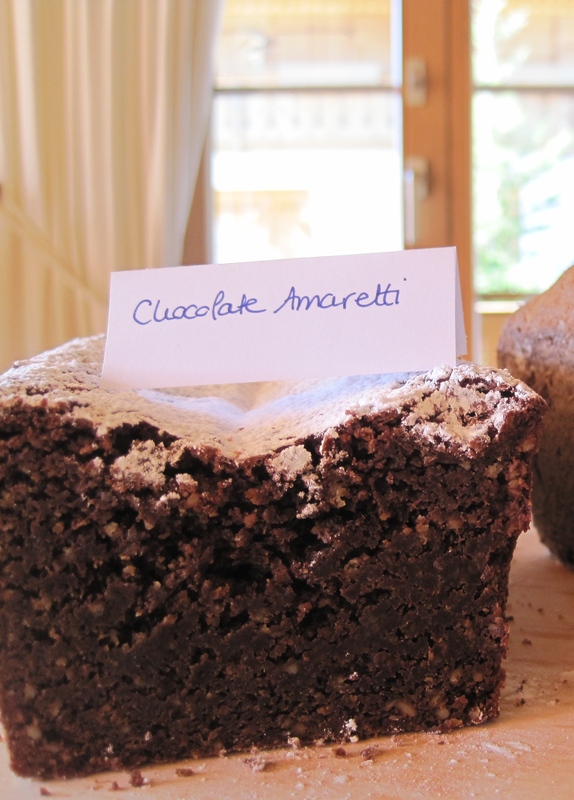 A true must for both chocolate and amaretti lovers. Amaretti are possibly my favourite biscuits, they should be yours too. And don’t get me started on Amaretto, the tastiest liquor ever created. Those sours are dangerous. Remind me again why I decided to give up alcohol for Lent? At least there are only 22 days left and Fortnum’s Easter sponge pudding (honey, amaretto & almond sponge pudding with a soft chocolate centre….nom) waiting at the end of it. Not to forget the amaretto butter topping, Easter dessert wouldn’t be half as good without it. Enough about Amaretto. This cake, like the Linzer, is best after having rested in a cool place (e.g. cellar) for a day or two. Perfect if you have a lot of baking or cooking planned!